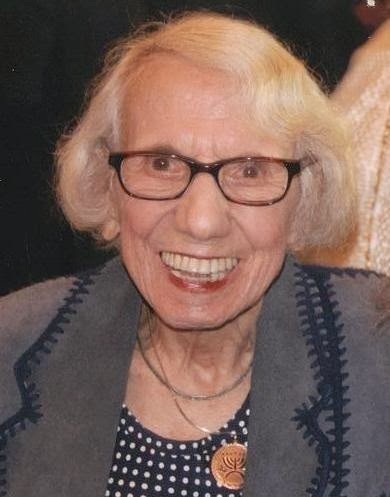 From Helen Friedman, Executive Director: "Americans for a Safe Israel mourns the passing of our beloved volunteer of over twenty years, Charlotte Wahle (z"l). She was buried today at the Beth-El cemetery in Paramus, NJ. Rabbi Schwartz and Rabbi Gans officiated. A devoted group of family and AFSI friends, who made up a large part of her extended family, were present to pay their last respects. An Israeli flag was placed at her grave symbolizing her great passion for Yisrael Shlayma (a whole Israel). Those who knew Charlotte were always amazed at her tenacity and devotion to AFSI and its principles. She was at every demonstration and protest, wrote letters to the editor, and was a driving force in the AFSI office, even in her 92nd year of life. In addition, Charlotte's interests kept her active in her synagogue, in politics, and with her many friends and associates. Those wishing to send donations in her memory are encouraged to send them to AFSI, her favorite organization. Contributions can be sent by check, or through the donation buttons on the www.afsi.org website." Part of Charlotte's energies went to help arrange AFSI's "Chizuk" (Strengthening) missions to Israel. AFSI begins another trip this weekend, with Charlotte participating this time from shomayim. Helen Freedman spoke with JooTube last year about AFSI's tour which would focus on (rather than most others which avoid) Jewish settlements and outposts to live on Jewish holy lands. Many of these developments face the similar threat of uprooting that Gush Katif experienced in 2005, but at the behest of a new American administration. Well son of mine, you are doing what you dreamed for so long, now let Charlotte to lead you for a change. Lot of love and good luck to you both. Mum y Noel see you next year! If you have been interested just click www.domyassignment.net.